“Traditional” bluegrass features the instrument mix of mandolin, fiddle, banjo, guitar and string bass developed by Bill Monroe and his Bluegrass Boys in the late 1930s. That model became the genre standard, in part because of the many bluegrass superstars-to-be that served time in Monroe’s band. With their latest album, A New Day, northern Vermont’s Big Spike — one of precious few traditional bluegrass quintets playing in the state — demonstrates fresh chops with that venerable old setup. Since their first release, Cheatin’/ Lying/ Leavin’/ Crying, was reviewed in Seven Days in 2005, Big Spike has made a significant personnel change. The band’s newest addition, bass man and vocalist Mike Santosusso, is a veteran of Smokin’ Grass, a combo of hot young musicians who flirted with jamgrass and jazz a few years ago in Vermont. Santosusso’s voice is a sonorous tenor. He sings lead on a few numbers, and his vocals in the harmony mix of many songs on A New Day gives the music a whole new flavor. 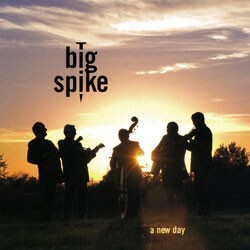 The majority of Big Spike’s repertoire here is originals — three by guitarist and legendary mandolin builder Pete Langdell; five by mandolin man (and ex-David Bromberg band mate) Neil Rossi; and one instrumental by banjoist Bill Gaston. Ace fiddler Freeman Corey adds tasty playing throughout. Instant bluegrass hits like Langdell’s “A Perfect Turn to Cry” and Rossi’s “Don’t Slam the Door When You Go” are interspersed with classics such as Jim & Jesse’s “I’ll Love Nobody But You” and a bouncin’ cover of George Jones’ “Why, Baby, Why?” The latter fit right in. The music on A New Day sounds like a unified whole with nothing out of place and no musical bumps in the road — the bluegrass is clean and meticulously played. Big Spike will be one of the featured acts at the Lake Champlain Bluegrass Festival this weekend in Alburgh. They will be joined by local favorites Banjo Dan & the Mid-nite Plowboys, world-famous Rhonda Vincent and Del McCoury Band, and The Gibson Brothers, who hail from across Lake Champlain in Ellenburg Depot. Go enjoy some fine traditional music!